CREATE YOUR OWN SYNCHRONIZED ROBOT ARMY! PLAN, DESIGN, ASSEMBLE, AND PROGRAM ROBOT SQUADS THAT COMMUNICATE and cooperate with each other to accomplish together what they cant do individually. 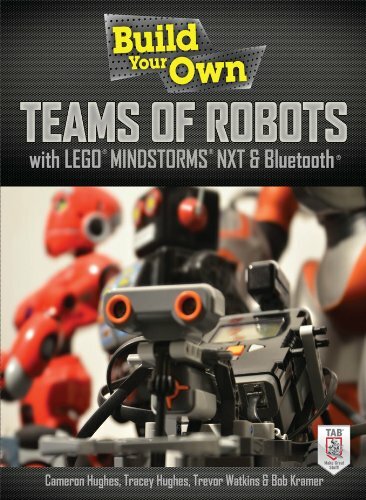 Build Your Own Teams of Robots with LEGO MINDSTORMS NXT and Bluetooth shows you how to construct a team capability matrix (TCM) and use the Bluetooth Robotic-Oriented Network (BRON) so your robot teams can share sensors, actuators, end effectors, motor power, and programs. Find out how the Bluetooth communications protocol works and how to program Bluetooth in NXT-G, NXC, LabVIEW, and Java. Learn how to send and receive Bluetooth messages, data, and commands among robots, between a robot and a computer, and between an Android smart phone and a robot. Through teamwork, your robots will be able to accomplish amazing feats! Watch video demonstrations of the projects and download code and examples in multiple languages (NXT-G, Java, LabVIEW, and NXC) from the book's companion website at www.robotteams.org. Downloads are also available at mhprofessional.com/robotteams.